Leading Trader of Compact Screw Compressors, OilInjected Screw Compressors, Service Of Compressors, Silent Screw Compressors, Variable Speed Drive Screw Compressors and HP 5HP To 100 HP Air Compressor Air Compressor For Rental from Chennai. atlas copco screw compressors have always set the standard for reliability and performance in the compressed air industry. With the new gx 2-11, atlas copco brings the power and reliability of an industrial screw compressor to small and medium sized industry. The advanced sound dampening of these units ensures silent power while simple reliability is guaranteed as the gx is suitable for 100% continuous duty. the gx 2-11 is delivered with all of the components required for a complete installation. Suitable for customers who have limited space, the package has a minimum footprint. The gx is also available with a built-in dryer to reduce the space requirements even further. In addition, all air connections have been optimized to minimize pressure drop and potential air leaks. the gx offers low energy consumption and high efficiency of a rotary screw compressor. The standard start/stop control on the gx 2-5 insures the compressor is only consuming power when compressed air is needed. The gx 7-11 is equipped with energy efficient load/no load control. 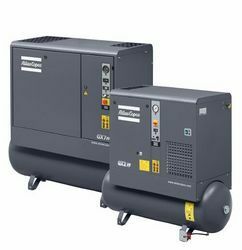 Compared to piston compressors that suffer from increased energy consumption over time, gx screw compressors always provide high efficiency. untreated compressed air contains moisture, aerosols and dirt particles that can damage your air system and contaminate your end product. Resulting maintenance costs can far exceed air treatment costs. We believe in effective prevention. low quality air heightens the risk of corrosion in your system, which can lower the life span of your air tools and production equipment. The ga’s filtration process produces clean air that enhances your system’s reliability, avoiding costly downtime and production delays. clean, treated air reduces the risk of corrosion and leaks in your compressed air system. A 3 mm leak could easily add up to1800 to your energy bill annually. compressed air coming into contact with your final products should not affect their quality. The ga provides the clean, dry air that will protect your product’s reputation in the marketplace. with leaks and energy waste minimized and the unsafe disposal of untreated condensate eliminated, you can safeguard the environment and comply with stringent international regulations. you take care of your business. Let the whizkid take care of your compressed air!